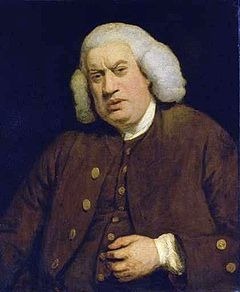 THAT MOST QUINTESSENTIAL of Londoners Dr. Samuel Johnson has become the capital’s favourite adopted son. He is the most quoted person in the English language after Shakespeare and with his famous verdict on the City “When a man is tired of London, he is tired of life; for there is in London all that life can afford”, has virtually guaranteed him iconic status. CABBIE (n.) (colloq). Erudite Fellow much given to express anti-Whig opinion who upon exchange of monies will, by Hansom carriage, convey a Person within London’s northern environs. Born in Lichfield, Staffordshire in 1709 and educated at Pembroke College, Oxford leaving without a degree due to ill health, Johnson came to London in 1737 and scraped a living as a journalist. By all accounts to remain in Johnson’s company would have required a strong stomach even for those days. He was grossly overweight who “had no passion for clean linen” and “showed no enthusiasm for bathing”, his wig didn’t even fit properly, and was usually singed on one side from holding a candle too near on account of his poor eyesight. MINI-CAB (n.) A Sedan with oriental provenance of indeterminate age used to convey the Inebriated by its Driver whose paucity of English is matched only by his geographical knowledge. Johnson’s wife Elizabeth “Tetty” Porter was no better, who in the opinion of his friend Robert Levett, was “always drunk and reading romances in her bed where she killed herself by taking opium”. In 1746 Johnson was commissioned by a syndicate of booksellers to write the first comprehensive Dictionary of the English Language. He rented at £30 per annum 17 Gough Square and with the help of his six amanuenses compiled the Dictionary in the garret. It was published in 1755. The painter, Sir Joshua Reynolds, on a visit to view the great man at work noted that “besides his books, all covered with dust, there was an old crazy deal table and a still worse and older elbow chair having only three legs”, which Johnson managed to sit upon without support. KNOWLEDGE, THE (n.) An accumulation of local information which doth give one granted the illusion of superior powers and wisdom. Johnson fell on hard times and left the house the following year, he was arrested for debt in 1758 and was bailed out by his friend Samuel Richardson. He went on to live in a number of lodgings dying in 1784, leaving a body of work as an essayist, journalist, satirist, novelist and as the leading literary critic of his time. He laid down standard for the use of English comparative literature and founded the Literary Club, but his Dictionary of the English Language was not (as is often claimed) the first English dictionary, but it was certainly the most important one published up to that date. It went through numerous editions, and was not superseded until the publication in 1928 of the Oxford English Dictionary. MUSEUM (n.) A repository of historic memorabilia much frequented by Children carrying pencils and clipboards, each bearing a bored countenance. Little is known of 17 Gough Square after Johnson’s departure until Thomas Carlyle visited it in 1832, who noted its dilapidated condition and described the tiny garden as little larger than a bed quilt. In 1910 the newspaper baron and Liberal Member of Parliament Cecil Harmsworth purchased the property for a reputed £3,500 and restored the house at his own expense to its original condition, opening it to the public in 1912 and at the same time a cottage was built as the Curator’s residence. The City of London suffered extensive damage during the Second World War and Dr. Johnson’s House was nearly destroyed on three occasions during the bombing of 1940-41. This elegant late 17th century house is the only original house in Gough Square, and the only remaining house of those many in which Johnson lived in London. The timber used in its construction is American white and yellow pine which was bought back as ballast in ships trading with the colonies. The House (open to the public) is now run by the Dr Johnson’s House Trust and the present Lord Harmsworth is the Chairman of the Board of Governors. BLOG (n.) Electronick diary unto which earnest fools do commit their innermost thoughts, safe in the knowledge that no man shall ever read them.